This recipe is kinda cobbled together from a bunch of different places because no single recipe seemed to be what I wished to make. 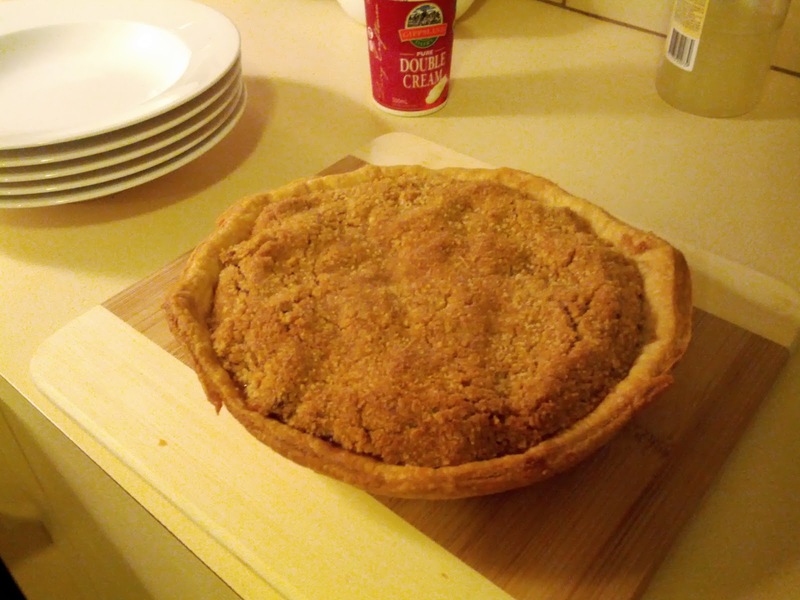 On the bottom is a standard shortcrust base. No sugar - there's going to be plenty of sweetness on top. Chop up 6 peeled and cored granny smith apples into thin(ish) slices (used my spiral peeler/corer). Don't worry if it looks like too much apple - it'll shrink as we cook out some of the water. 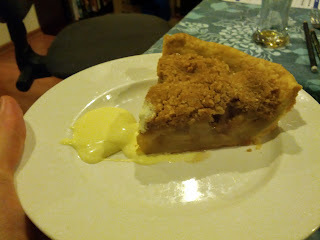 On the theory that you should never put fruit into a pie uncooked lest you end up with a soggy mess, I cooked the apple in a frying pan for about 20 minutes on a medium temperature in 50g of butter and 1/2 cup of castor sugar to reduce the amount of liquid and soften the apple. Added some cinnamon and a pinch of nutmeg. Yum! On the top is 1/2 cup flour, 1/2 cup brown sugar and about 45g butter which has been chopped into the flour and sugar to make little breadcrumbs. I used my mini blender (wand attachment) to do this chopping. Roll out the dough to fill a pie dish. The cooked apple, the crumble mixture and the pie base can all be prepared, covered and refrigerated before assembly when it's time to bake the pie. Blind bake the base for 15 minutes at 190ºC. Then put in the filling, cover with the crumble mixture and bake for another 40 minutes.